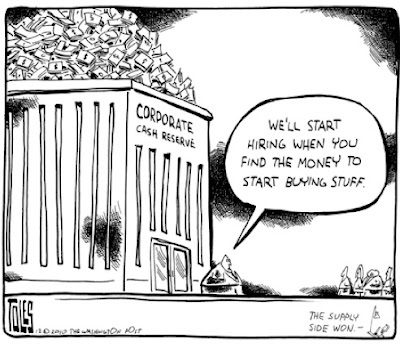 To this mix we can add the fact that many money managers are investing other people’s money. If you plan to stay with an investment bank for ten years or less, most of the people playing this investing strategy will make out very well most of the time. Everyone’s time horizon is a bit limited and you will bring in some nice years of extra returns and reap nice bonuses. And let’s say the whole thing does blow up in your face? What’s the worst that can happen? Your bosses fire you, but you will still have millions in the bank and that MBA from Harvard or Wharton. For the people actually investing the money, there’s barely any downside risk other than having to quit the party early. Furthermore, if everyone else made more or less the same mistake (very surprising major events, such as a busted housing market, affect virtually everybody), you’re hardly disgraced. You might even get rehired at another investment bank, or maybe a hedge fund, within months or even weeks. In short, there is an unholy dynamic of short-term trading and investing, backed up by bailouts and risk reduction from the government and the Federal Reserve. This is not good. “Going short on volatility” is a dangerous strategy from a social point of view. For one thing, in so-called normal times, the finance sector attracts a big chunk of the smartest, most hard-working and most talented individuals. That represents a huge human capital opportunity cost to society and the economy at large. But more immediate and more important, it means that banks take far too many risks and go way out on a limb, often in correlated fashion. When their bets turn sour, as they did in 2007–09, everyone else pays the price. John Taylor approvingly cites a JPMorgan note criticizing economics textbooks' treatment of the money multiplier. 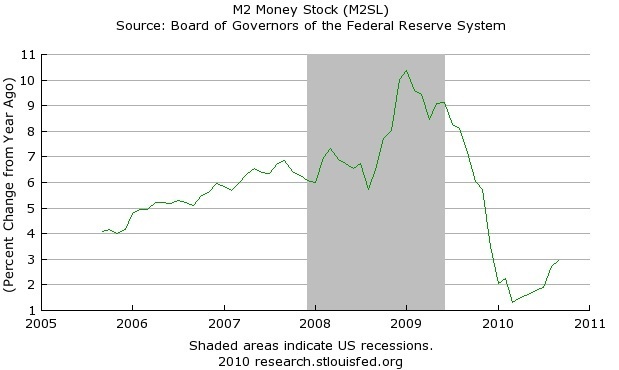 The money multiplier relates the monetary base, which is directly manipulated by the Fed's open market operations, to the money supply, which is what actually affects the economy in most economic models. The very simple version of the calculation is that the money multiplier is 1/rr where rr is the "reserve ratio" of bank reserves to deposits. If one assumes a constant money multiplier, then the dramatic increase in the monetary base since mid-2008 implies a huge (and frighteningly inflationary) increase in the money supply. 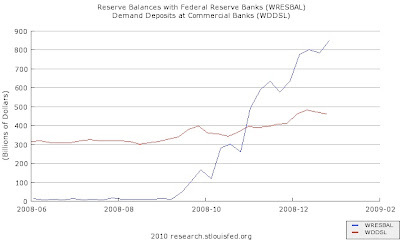 The growth of the Fed’s balance sheet, which has been funded by an increase in commercial banks’ reserve balances at the Fed, has sparked fears that the “money multiplier” mechanism would translate those reserves into an explosion in bank lending, bank deposits, and inflation. None of these things has happened, because the money multiplier no longer makes sense given the institutional framework of the contemporary banking system. In spite of being almost totally divorced from reality, the money multiplier is still taught in undergraduate economics textbooks, with much resulting confusion. While there have been quite a number of changes in the "institutional framework," which textbooks (and professors) may not want to treat in detail, the most basic flaw in the analysis which is being attributed to "undergraduate economics textbooks" is naively assuming a constant money multiplier. I don't think that is a fair accusation. Indeed, the only reason why money multipliers are interesting to talk about in class is that they can change. In normal times, it makes sense for banks to hold as few reserves as they can get away with (they can lend excess reserves on the "interbank" loan market, and if they're short, they can borrow them, too). But in unusual times, the calculation changes and banks respond to a riskier environment by holding more reserves, which reduces the money multiplier. This issue normally enters an undergraduate economics course in a discussion of the Great Depression. Milton Friedman and Anna Schwartz showed that the money multiplier fell during the banking panics of the early 1930's. 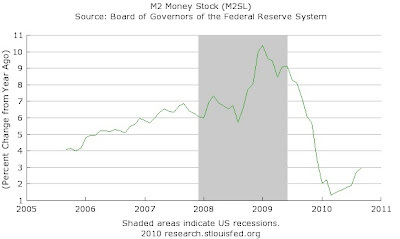 Because of the fall in the money multiplier, the money supply actually was decreasing even as the Fed increased the monetary base. 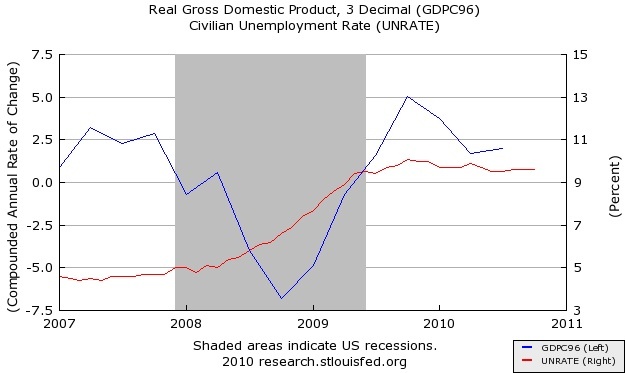 This example has become part of the case the Fed bungled the depression. Both the Mankiw and Abel and Bernanke intermediate macroeconomics textbooks discuss this case immediately after algebraically deriving the money multiplier. 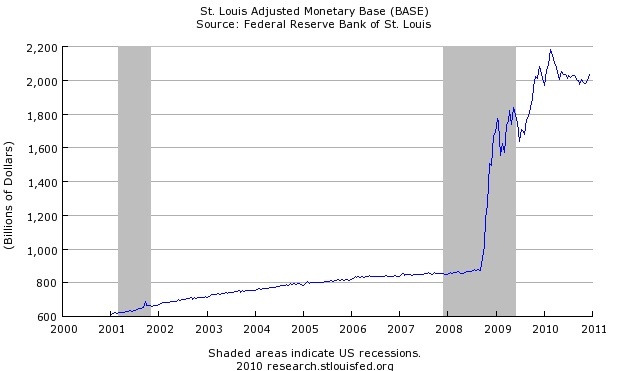 The sudden increase in the monetary base (blue line) occurred in late 2008. In the same period, deposits (red) also rose, but much less dramatically, which means there was a large increase in the reserve ratio. 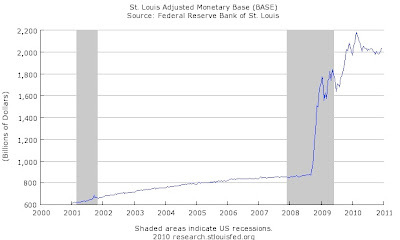 The Fed announced on October 6, 2008 that it would begin paying interest on reserves. 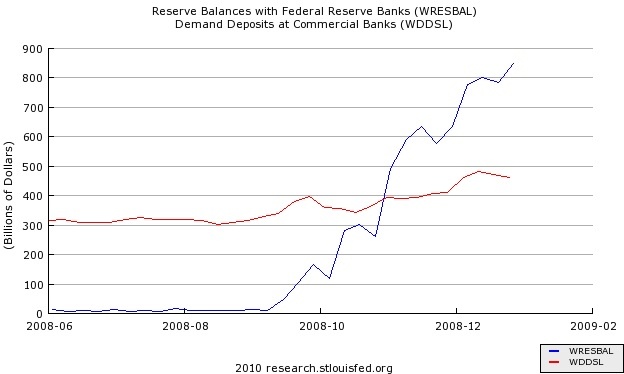 This is is the dominant factor in the increase in both the quantity of reserves and the reserve ratio. Interest on reserves does indeed represent a significant change in the institutional framework which isn't included in traditional textbook treatments. However, looking a little more closely at the graph one can see that reserves began to increase in September. Reserves rose from $9bn on Sept. 10, to $47bn on Sept. 17 and $104bn on Sept. 24 - a more than tenfold increase over two weeks. Those two weeks, of course, were the absolute worst days of the financial panic of 2008 (Lehman declared bankruptcy on Sept. 15). At a time when the interbank lending market suddenly appeared risky, it is not surprising that banks would exercise more caution and increase reserves, thereby reducing the money multiplier. And that is likely quite consistent with what students read in their undergraduate economics textbooks. Not surprisingly, our political discourse has a hard time wrapping its head around the fiscal policy conundrum that we currently face, which is that we need more stimulus (bigger deficits) now, but long-run budget projections imply that we need to make future deficits smaller, because we are likely to still have a deficit when the economy returns to full employment and it may balloon further in the future mainly because of rising healthcare costs. There is a valid concern that, when the economy recovers, the federal government's large borrowing needs could "crowd out" investment. 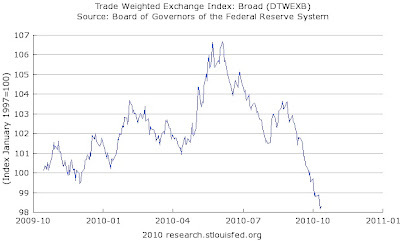 While there is absolutely no evidence that this is a problem now or in the immediate future (as evidenced by continued low Treasury yields), the scheduled reversion of the tax code to the status quo ante-Bushum does create a unique opportunity to deal with the long run problem. As it happens, the projected level of revenue if the tax cuts expire looks close to about right in the long run (see the "extended baseline" in the CBO's long-run outlook). While the Clinton-era tax code isn't ideal in terms of equity or efficiency, clearly we didn't do too badly when it was in effect. The beauty of "current law" is that it makes Washington's natural tendency towards gridlock work for, rather than against, a solution. All we need is for any of (i) congress to not agree, (ii) a Senate filibuster not to be overcome, or (iii) the president not to sign, and our deficit problem is largely solved. If unemployment wasn't 9.8%, I might therefore be in the "let them expire" camp (even the "middle class" parts), but, as things stand, the economy urgently needs more fiscal policy support now. A tax increase is the exact opposite of what we need in the short run. The expiration of the tax cuts is used to force a tax reform that simplifies the tax code and eliminates tax expenditures (i.e., closes loopholes). This broadening of the tax base could raise revenue, and maintain progressivity (since it is high incomes that benefit most from loopholes), while keeping marginal rates low. The Bowles-Simpson proposal did move in this direction - on progressivity, it landed between the Clinton and Bush tax codes (according to the TPC) - but it had an arbitrary cap on revenue at a too-low level. At full employment, the ideal reform would be revenue neutral compared to a "current law" baseline (i.e., it would bring in the same revenues as the Clinton tax code over the long-run). 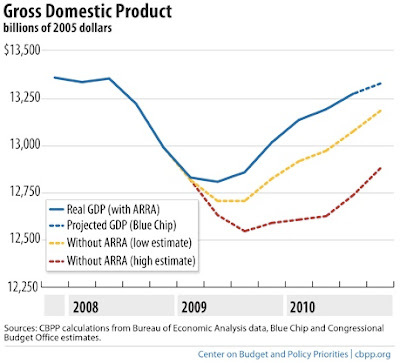 The short-run negative effect of the resulting tax increase would be offset (and thensome) with explicitly temporary fiscal stimulus, perhaps with a built-in trigger mechanism to unwind it automatically as the economy recovers, which would serve to minimize the inevitable push for extensions. The tax cuts are allowed to expire, reverting to the Clinton-era tax code, but accompanied by the same type of stimulus described above. The original Obama-Democratic policy of making the "middle class" tax cuts permanent while reinstating the Clinton-era rates for income above $250K. Raising taxes on the rich is anti-stimulative, but not very (the multiplier is low), so the long-run deficit reducing benefit outweighs the short-term cyclical cost. The whole thing expires (which may still happen - its not clear the deal will get through Congress), which solves our long run problem, but leaves us hoping even more fervently that Fed gets enough traction to keep the recovery going, even as the tax increase makes the headwinds stronger. The preferred Republican policy of making all the tax cuts permanent, which has the virtue of not making things worse in the short run, but will eventually lead us back to the low-investment economy of the late 1980's and have us talking about cutting social security and medicare. I'd put this week's deal somewhere between #2 and #3, and given that #3, 4 and 5 seemed to be what was realistically on the table, I can't be too disappointed (even if I sympathize with the widespread concern that President Obama's poker skills seem to have mysteriously diminished). One concern is that extending the Bush tax cuts entrenches them further and increases the risk that they become one of those features like the alternative minimum tax "patch" that we expect to be perenially "fixed." But the two-year extension does leave open the possibility of something like #1 or #2 happening in 2012, and at least we haven't decisively dug the long-term hole deeper as #5 (and, to be honest, #3) would. We have also averted the short-run damage that would result from #4 (and to a much lesser extent, #3). Not only have we avoided that anti-stimulus, but the deal includes other demand-enhancing provisions, like the one-year payroll tax cut (which replaces the expiring "making work pay" credit from the 2009 stimulus bill, but is bigger, though less progressive). David Leonhardt calls it a "second stimulus" (third, if you count the spring 2008 tax rebate). The Center for American Progress applied existing multiplier estimates to the deal's provisions to estimate that it would increase employment by about 2.2 million (relative to unemployment of 15 million). Macroeconomic Advisors estimates a GDP growth bump of 0.5-0.75 percentage points. (Both of these come to my attention via the invaluable Ezra Klein). Of course, it would be better still if the unemployment insurance extension was for two years (even if the recovery gathers steam, there will still be many people unemployed in 2012), and included something for the "'99ers" who have hit the 99-week limit on benefits (recall that the recession began at the end of 2007). They also should have raised the debt ceiling, so it doesn't become the next "hostage". One might hope the outrage of Congressional Democrats gives them some leverage to make improvements (indeed, if the Democrats were an organized political party, I might think there was a clever "good cop, bad cop" routine being employed here). Note: the title of the post refers to the official name of the 2001 tax cut, the Economic Growth and Tax Relief Reconciliation Act. Barack Obama's Time Consistency Problem? When I explain the time-consistency problem to my students, I begin by asking them what the stated position of the government is about negotiating with hostage takers. They know, of course, that the official line is that the government will not negotiate. The reason why governments always say they will not negotiate with hostage takers is that, if they won't negotiate, there is no incentive to take them in the first place. But, once hostages have been taken, the government has a strong incentive to negotiate because they don't want to be responsible for the hostages getting killed. And the problem is that the would-be hostage takers understand this, and therefore do not believe the government will follow its announced policy of not negotiating. I’ve said before that I felt that the middle-class tax cuts were being held hostage to the high-end tax cuts. I think it’s tempting not to negotiate with hostage-takers, unless the hostage gets harmed. Then people will question the wisdom of that strategy. In this case, the hostage was the American people and I was not willing to see them get harmed. One of the implications of the time consistency problem is that a better outcome would be achieved if the government didn't have discretion to negotiate with the hostage takers. In the real world, no perfect "commitment technology" exists so, in practice, we think about "credibility". That is, how can the government behave so that the prospective hostage takers believe the authorities really mean it when they say they won't negotiate? So, the question is: did President Obama diminish his credibility, thereby increasing the likelihood of future political "hostage" situations, or did he just say what everyone already knows? And was the Republican threat credible to kill the hostages let the tax code revert to its 2000 levels if the tax cut extension for incomes over $250,000 wasn't included? (John Boehner's slip in September notwithstanding). For background on time consistency and more examples, see Greg Mankiw, this speech by Charles Plosser, and the Nobel Prize information about Kydland and Prescott. The cost of breaking up the single currency would be enormous. In the ensuing chaos and recrimination, the survival of the EU and its single market would be in jeopardy. But by believing that a break-up cannot happen, the euro zone’s authorities will always tend to stop short of the radical measures needed to hold the project together. Given the likely and devastating chaos, it would be a mistake for a country to choose to leave. But mistakes occur in times of stress. That is why some are beginning to contemplate the unthinkable. A demonstration of commitment to Europe requires a little bit from everyone, and what it requires from the ECB is that it act like the European Central Bank, rather than just a Bundesbank that gets to impose unreasonably hard money on everyone in the single currency. Mr Trichet, who has had to earn his post by acting as German as a Frenchman can possibly be expected to act, seems to be realising that that's not actually what's required of the ECB. The Irish “programme” solves exactly nothing – it simply kicks the can down the road. A public debt that will now top out at around 130% of GDP has not been reduced by a single cent. The interest payments that the Irish sovereign will have to make have not been reduced by a single cent, given the rate of 5.8% on the international loan. According to the deal, not just interest but also principal is supposed to begin to be repaid after a couple of years. At that point, Ireland will be transferring nearly 10% of its national income as “reparations” to the bondholders, year after painful year. This is not politically sustainable, as anyone who remembers Germany’s own experience with World War I reparations should know. A populist backlash is inevitable. The Commission, the ECB, and the German Government have set the stage for a situation where Ireland’s new government, once formed early next year, rejects the budget negotiated by its predecessor. Even measures like this, which fall far short of what would be necessary to end the crisis, are tough to get the Germans to sign off on. Though its not surprising that loans to Greece and Ireland are bad politics in Germany, it needs to be remembered that the problems of some of the peripheral countries are due, in part, to the fact that ECB policy, which placed more weight on Germany (because its bigger) was too loose for them. This helped create the bubbles that have now burst. Moreover, much of the debt involved is owed to German (and other European) financial institutions, so this is really a "bailout" of Germany's banks. Europe faces both sovereign debt and monetary policy problems. Some of the countries have too much debt, and a restructuring is probably in order. But if they're going to avoid that - and they seem determined to (though don't they always?) - a more expansionary monetary policy would help them grow (and inflate) their way out of trouble. Without more inflation, the peripheral countries really need not just loans, but fiscal transfers from those that are in better shape (i.e., some kind of fiscal union is needed - on this, see Gavyn Davies). Wall Street analysts often cite possible government regulations on the environment as another source of damaging uncertainty. But as with the deficit, inaction could be far more damaging than action. Climate change and dependence on foreign oil are problems that won’t go away on their own. Tabling plans to deal with them doesn’t make it easier for companies to plan and invest; it makes it harder. Until businesses and communities know the costs and incentives for developing renewable energy, nuclear power and natural gas — and whether we will address climate change through prices or direct regulation — it will be very hard to invest in new power sources and related industrial technologies. What we research, and what we believe, aren't necessarily the same thing. What gets published in the journals is a survey of what we are currently researching. It isn't an accurate survey of what we currently believe. The whole point of a journal is not to publish what everybody already believes. The journals are a map of where we are currently exploring for gold. They are not a map of existing gold deposits. They are not a map of where we think gold might be found in places we can't currently explore. To which I might add, economic models can be thought of as tools. Using a particular tool (model) to do a job (normal science) shouldn't be taken to imply a belief that the model is the right one for all economic phenomena. In many cases, its much easier to make progress (and get papers accepted) if one uses existing tools. For instance, I've used a real business cycle model in my own research - it turned out to be an effective device to implement an idea I had about real exchange rate volatility. But it does not mean that I believe that real business cycle theory is a correct explanation of economic fluctuations. The BLS November employment report is a bummer, especially in the wake of mostly improving economic reports (e.g., consumer confidence, unemployment insurance claims, regional manufacturing surveys, etc). According to the BLS, employment increased by a mere 39,000 and the unemployment rate rose from 9.6 to 9.8%. The rise in the unemployment rate was not, alas, due to people re-entering the labor force - the participation rate was unchanged at a (depressed) 64.5%. According to the household survey, 173,000 fewer people were employed in November (recall that the headline employment number comes from the separate survey of businesses, while the unemployment rate is calculated using the household survey). If the other, positive, economic reports are ultimately reflected in strong fourth quarter GDP, the employment numbers would be an indication of rising productivity (for the third quarter, the BLS reported 2.3% labor productivity growth). 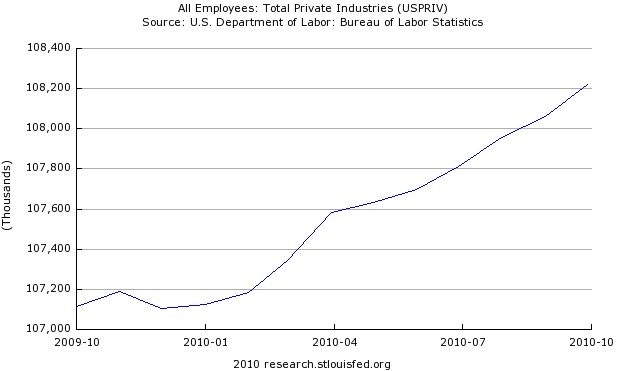 Out of the 15.1 million unemployed (!!!! 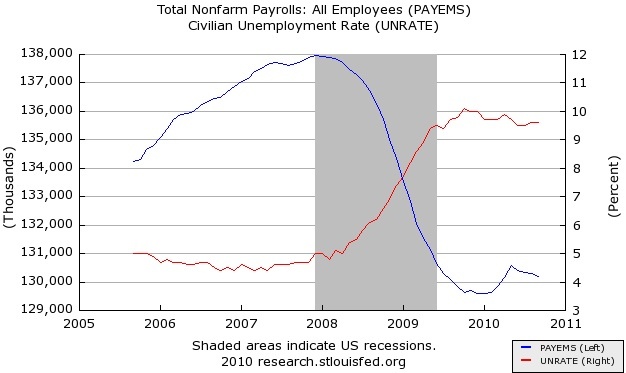 ), 6.3 million have been unemployed for more than 27 weeks. There was a good article yesterday in the Times on how long-term employment can have persistent effects, as people who have been unemployed for a long time become less employable (a form of what is sometimes called "hysteresis" in the economics literature). Hopefully the report will concentrate some minds in Washington (but don't hold your breath). It should strengthen the President's attempt to salvage an extension of unemployment benefits from the negotiations with the Republicans on extending the Bush tax cuts. November is one of the months when the seasonal adjustment makes things look worse - on an unadjusted basis, the unemployment rate was 9.3% (up from 9% in October), and payroll employment increased by 217,000. For more on the employment report, see Calculated Risk, David Leonhardt, Free Exchange, and Real Time Economics' roundup. Update: Mark Thoma is critical of the White House response. Floyd Norris has a reason to hope for an upward revision. Today's macroeconomics class arrived at the point where I needed explain how bond prices and yields are inversely related. Fortunately for us economists, the British government has issued perpetual bonds - i.e., bonds which pay a fixed amount ("coupon"*) to the holder with no end date - known as "consols," which make the concept easy to illustrate. If one pays £100 for a consol with a coupon of £5, the yield is 5% (5/100). If market interest rates rise to 10%, the consol would only be worth £50 (since 5/50 = 0.10). I was asked if the consols, which were first issued in the 18th century, still exist today. A little internet "research" confirms that, indeed, these long-ago loans to the British government are still providing the descendents of the aristocracy with the income to cruise around Kensington in Rolls-Royces. This wikipedia entry explains briefly the history of consols. According to the UK Debt Management office, there is £177 million worth of "2.5% consolidated stock" still outstanding (there are several other issues, too). As of today, according to a British trading website, the 2.5% consol is trading at 56.52, which means a yield of 4.4% (2.5/56.52 = 0.044). This post at the FT Alphaville blog has a graph of consol yields going back to 1729. Hmm... perhaps I should buy some, so that next time the question comes up, I can say, "yes, I have some." *I'm not sure "coupon" is good terminology for consols - it comes from bonds that included coupons that the owner would physically cut off and redeem for the interest payments. That wouldn't work with a perpetual bond. Friedman would likely make the case today for more aggressive monetary action. It is time for "Helicopter Ben" to earn his nickname. Beckworth has more at his blog. On a related note, Brad DeLong argues that neither Friedman nor Keynes would be pleased with the new British government's austerity policy. Financial markets expect the Fed to announce at its meeting early next month that it will proceed with more quantitative easing, involving purchases of bonds, which reduces longer-term interest rates and puts further downward pressure on the dollar. That worries other countries. A stronger United States economy is in everyone’s interest, but they fear that investors will flee America’s low interest rates and declining dollar and instead pour capital into their markets, overheating their economies and creating the types of asset bubbles in stocks and housing that burst with such devastating effects in the 1990s. Already there is evidence of this: American investment in overseas stock funds, which was running at about $4 billion a month over the summer, has surged since Ben S. Bernanke, the Federal Reserve chairman, suggested the possibility of another round of quantitative easing at the end of August. About $19 billion has flowed into these funds since Aug. 1, according to TrimTabs, a funds researcher. The great thing about expectations is that a policy can have an effect before it is implemented - the mere fact that the Fed is expected to announce a new round of expansion in November has been enough to help get the dollar down after its summer spike due to the Euro crisis. Exchange rate movements tend to have a significant lag in their effect on the economy, but if the decline in the dollar persists, it will benefit tradable goods sectors and improve the trade balance (i.e., increase the NX component of GDP). So, while I am concerned about whether pushing down long-term interest rates really will do much to stimulate investment (I in GDP), anticipation of the policy is already building in a stimulative effect through the exchange rate channel (and, moreover, the markets are speaking). If other countries want to prevent their exchange rates from appreciating, they should respond with easing of their own, which from my perspective would be a win-win outcome for everybody. If other countries feel that easing is contraindicated for their domestic situation, then isn't that part of the case why the dollar needs to depreciate relative to their currencies, given the current economic conditions in the U.S.? Or, more bluntly, "the dollar may be our currency, but your problem." That, of course, is what Nixon's Treasury Secretary John Connolly famously said in 1971, as the Bretton Woods system collapse. While I doubt Tim Geithner would speak so directly today, perhaps we are indeed at the end of the so-called Bretton Woods II regime, as Tim Duy predicted recently (see also Ryan Avent and the amusingly hysterical Ambrose Evans-Pritchard). Raise Greg Mankiw's Taxes, Please! I should start out by saying that I'm a fan of Greg Mankiw. He has written some important (and good!) papers that have made influential contributions to both business cycle and growth theory. Moreover, he is a very good writer - his academic work is enjoyable to read (which is rare!) and he communicates well to a general audience (though sometimes his political biases - which are different from mine - do show through). I've used several of his papers in classes I've taught, and I've been a (mostly) satisfied user of his intermediate macroeconomics textbook since I began teaching the course as a grad student back in 2003. So, if Mankiw's marginal tax rate reverts to its Clinton-era levels as scheduled under current law, when his editor calls to tell him its time for a new edition of his textbook, he would decline? If we're doing a social cost-benefit analysis of changing Greg Mankiw's marginal taxes, we should account for externalities, positive and negative. Following Mankiw's lead, I'll use myself as an example, and explain a benefit to reducing Mankiw's labor supply that should be accounted for in his analysis. I would be better off if he decided the marginal benefit of an cranking out eighth edition was less than the marginal cost, and so would my students. The churning of textbook editions (and this isn't Mankiw's fault, to be sure) is a real headache to instructors, and helps keep the cost high for students. Though I'm sure it was well-intentioned (and thoroughly focus-grouped) a number of the changes from the sixth to seventh edition of his textbook made it worse from my point of view. For example, I rather liked his discussion of New Keynesian and Real Business Cycle theory, which were supplanted by a "dynamic aggregate demand and supply" chapter that I'm not inclined to mess with. And don't tell me I need my book "updated" for "current events." One of the fun things about teaching macroeconomics is that the world is always giving us interesting new examples to talk about. But I can handle that quite well without some new "economics in the news" sidebars grafted into the textbook. However, while the theoretical case that marginal tax rates can change behavior is clear, I'm not convinced, as an empirical matter, that Mankiw's would actually change. After all, his book was first published in 1992, and he issued new editions in 1994 and 1997 when higher marginal tax rates on high levels of income (and capital gains and estates) were in effect. Mark Thoma and Brad DeLong suggest some other possible shortcomings in his argument. According to the BLS, in September the economy lost 95,000 jobs, and the unemployment rate held steady at 9.6%. Neither of those headline numbers is pleasant, but the first is more discouraging than the second - I suppose the choice of which one to emphasize depends on whether one sees the glass 10% full or 90% empty. In this case, the reason for the discrepancy is the fact that the jobs number comes from a survey of businesses while the unemployment rate is calculated from a separate survey of households. (Another potential explanation would be a decline in labor-force participation, but in September it remained unchanged.) According to the household survey, the number of people employed actually increased by 141,000 (the payroll number from the establishment survey is usually preferred because it has a larger sample). 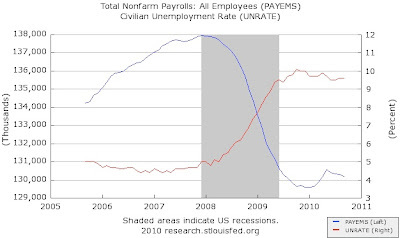 The decline in payrolls of 95,000 is the sum of an increase in 64,000 in private-sector jobs and a loss of 159,000 government jobs. Federal government employment fell by 76,000 (77,000 temporary census jobs ended), state government employment fell by 7,000 and local government employment fell by 76,000 (of which 49,800 were in education). So, ironically enough, the headlines from the last BLS report before the election will probably give a little more momentum to those who think "government spending" is the problem, even though the report shows that cuts in government spending are already acting as a drag on the economy. One potential bit of good news from the bad news is that the gloomy report provides another piece of evidence to support the case within the Fed for more aggressive quantitative easing ("asset purchases"). The headline numbers are all seasonally adjusted to remove regular fluctuations that occur during the year. On a non-seasonally adjusted basis, the unemployment rate fell from 9.5% to 9.2% (i.e., the seasonal adjustment factor raises the unemployment rate in September). Also, non-seasonally adjusted payrolls rose 428,000 - including an increase of 865,800 in the "local government-education" category, so I think the correct interpretation of the government job loss is that fewer teachers and education workers were hired this year than usual. Also, non-seasonally adjusted private payrolls fell by 412,000, so the seasonally-adjusted gain of 64,000 means that the private sector did not shed as many jobs as usual for this time of year. See also: Economix, Free Exchange, Calculated Risk and RTE's round up of reactions. The Washington Post's Neil Irwin has a nice slide show to illustrate the output gap under several scenarios. Check it out! Treasury reckons that taxpayers will lose less than $50 billion at worst, but at best could break even or even make money. Its best-case assumptions, however, assume that A.I.G. and the auto companies will remain profitable and that Treasury will get a good price as it sells its corporate shares in coming years. The Treasury has come out ahead on the money invested in the banking system - for example, it is making a profit on its investment in Citigroup. The losses, if there are any, will come from the investments in the auto industry, and in AIG (which has announced a plan for unwinding its government ties). Among those who voted for the program in 2008, several Republicans have lost nominating contests for re-election or for another office, and others are on the defensive in fall races. Senator Robert F. Bennett of Utah was “Bailout Bob” to Republicans who refused to re-nominate him for a fourth term. “For those who were screaming at me — and screaming was the operative word — ‘You’ve just saddled our children and grandchildren with $700 billion,’ I said, ‘No, I haven’t,” Mr. Bennett said in an interview. He may be right. But, for now, we are getting most of the money back, and our politics would be significantly different if people understood that much. The genius of this is that you now don’t need to have monetary policy matters be the subject of debates on op-ed pages and blogs with various board members giving interviews and speeches. If 2 percent inflation is too much inflation, well that’s on the heads of the politicians who set the target. If inflation is over 2 percent, then the Bank of England needs to tighten. And if inflation is below 2 percent, then the Bank of England needs to expand. Consequently, when faced with a giant downturn the Bank of England has had none of the self-induced paralysis of the Fed, the ECB, or the Bank of Japan. CPI inflation remained well above the 2% target, elevated by temporary effects stemming from higher oil prices, the restoration of the standard rate of VAT to 17.5% and the past depreciation of sterling. 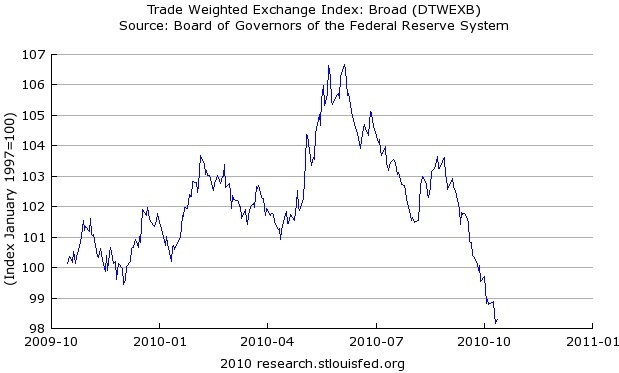 And the forthcoming increase in the standard rate of VAT to 20% will add to inflation throughout 2011. As these effects wane, downward pressure on wages and prices from the persistent margin of spare capacity is likely to pull inflation below the target. 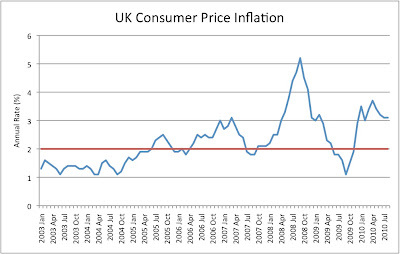 But the pace and extent of that moderation in inflation are impossible to predict precisely. The FT's Money Supply blog notes that the IMF approves of Britain's current loose monetary/tight fiscal policy mix (see also Free Exchange's comments). But it is not clear that the inflation target has been helpful... indeed, the risk is that, by allowing inflation exceed the target, the Bank of England is damaging the "credibility" that inflation targeting was designed to buy. Considering the circumstances, I'm inclined to believe that's a risk worth taking, it does raise questions about the whole inflation targeting concept. Inflation targeting is still relatively new. New Zealand was the first country to implement it, in 1988. The current global slump is inflation targeting's first real test, and, after the dust settles it will be interesting to evaluate how it performed. The Federal Reserve broke a taboo yesterday when it said quite baldly that inflation in the US is now below the level “consistent with its mandate”. In other words, it is too low. This is a very big statement for any central banker to make, since the greatest feather in their collective cap is that they successfully combated inflation after the 1970s debacle. Led by the Fed’s Paul Volcker, they re-asserted the importance of monetary policy, after two decades of failed wage and price controls. Since that period, most central bankers have been careful to avoid any language which even hints that a rise in inflation is acceptable to them. I can certainly find no previous record of the FOMC saying that inflation is too low, so it was a jolt to see this stated so starkly in the Fed statement yesterday. 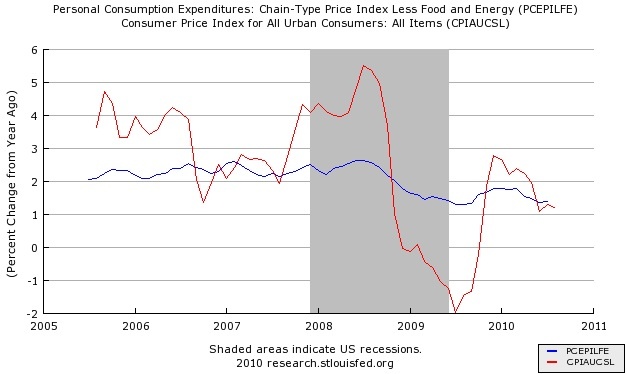 Those who are still worrying about inflation, in spite of the data, are fighting the last war. 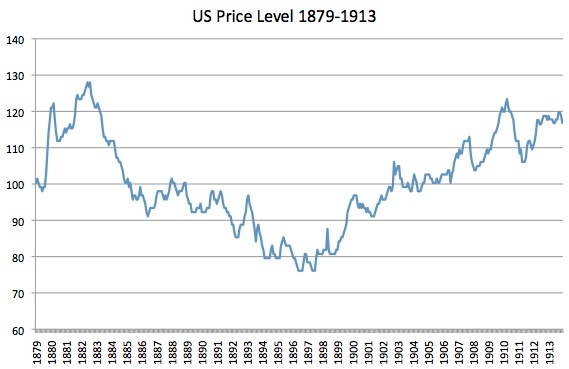 Fortunately, the Fed isn't interpreting the "price stability" part of its mandate to mean "zero inflation." The projection of board members' for inflation in the "longer run" can be taken as its unofficial target; as of the last release in June, they were aiming for expecting 1.7%-2.0% (as measured by the deflator for personal consumption expenditures). 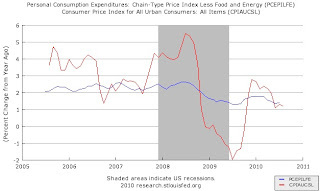 Both the consumer price index (red line) and core PCE deflator are consistent with the notion that the Fed is missing its target. Moreover, the Cleveland Fed's estimates are for CPI inflation, which is generally higher than PCE inflation. The Fed didn't actually do anything about this, but the acknowledgment of the problem is a step in the right direction. 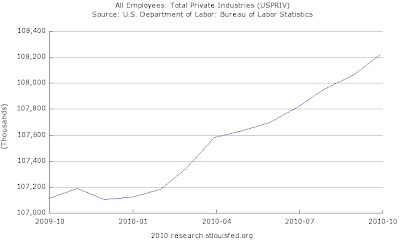 [A] trough in business activity occurred in the U.S. economy in June 2009. 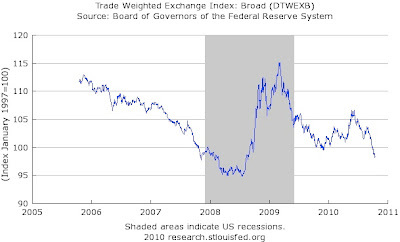 The trough marks the end of the recession that began in December 2007 and the beginning of an expansion. The recession lasted 18 months, which makes it the longest of any recession since World War II. 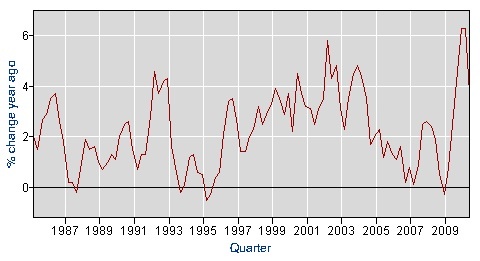 Previously the longest postwar recessions were those of 1973-75 and 1981-82, both of which lasted 16 months. A: It's more accurate to say that a recession—the way we use the word—is a period of diminishing activity rather than diminished activity. So, since June, we've been in a period of non-diminishing activity. That's certainly better than continuing contraction, but growth has not been fast enough to make a substantial dent in unemployment. 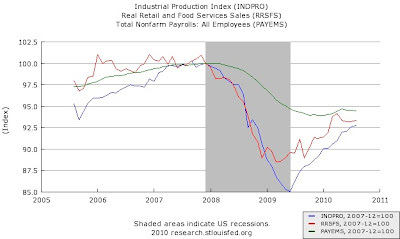 In the chart below, the red line shows retail and food service sales, and the blue line is the industrial production index, both normalized to 100 at the Dec. 2007 peak. 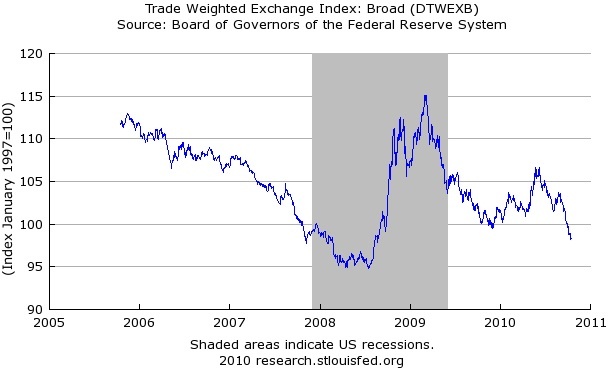 Both turn up around the end of 2009, but 14 months into the recovery, their levels remain below the previous peak. 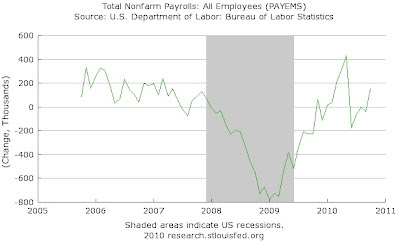 Employment (green line) continued to fall for several months after the end of the recession and has only improved slightly since. 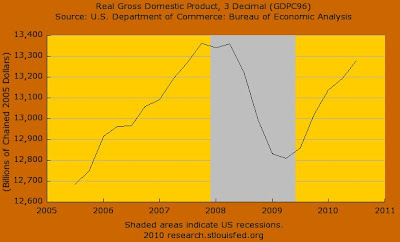 The phrase "growth recession" describes this state of slow growth and non-declining unemployment, but its somewhat cumbersome. I've found myself using the word "slump" alot. See also: Mark Thoma and Catherine Rampell (who talked to Robert Gordon). Output expanded robustly after 1933. 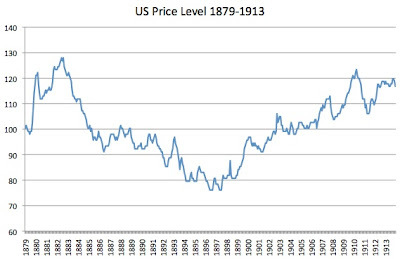 Between 1933 and 1937, the US economy grew by 8% a year. Between 1938 and 1941, growth averaged more than 10%. Rapid output growth without equally rapid capital-stock or employment growth must have reflected rapid productivity growth. This is the paradox of the 1930’s. Despite being a period of chronic high unemployment, corporate bankruptcies, and continuing financial difficulties, the 1930’s recorded the fastest productivity growth of any decade in US history. How could this be? As the economic historian Alexander Field has shown, many firms took the “down time” created by weak demand for their products to reorganize their operations. Factories that had previously used a single centralized power source installed more flexible small electric motors on the shop floor. Railways reorganized their operations to make more efficient use of both rolling stock and workers. More firms established modern personnel-management departments and in-house research labs. There are hints of firms responding similarly now. General Motors, faced with an existential crisis, has sought to transform its business model. US airlines have used the lull in demand for their services to reorganize both their equipment and personnel, much like the railways in the 1930’s. Firms in both manufacturing and services are adopting new information technologies – today’s analog to small electric motors – to optimize supply chains and quality-management systems. 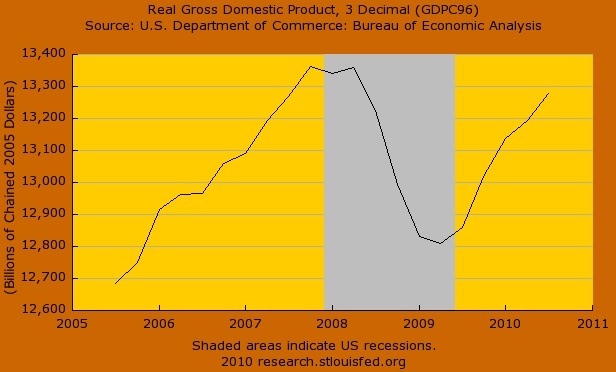 A similar argument has been made that extensive business restructuring around the time of the 2001 recession contributed to productivity growth in the following years. 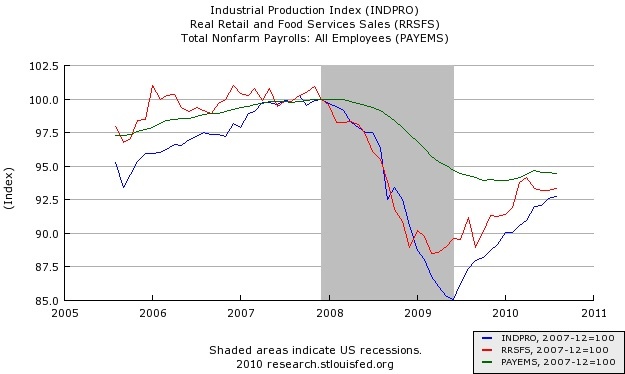 But this positive productivity response is not guaranteed. Policymakers must encourage it. Small, innovative firms need enhanced access to credit. Firms need stronger tax incentives for R&D. Productivity growth can be boosted by public investment in infrastructure, as illustrated by the 1930’s examples of the Hoover Dam and the Tennessee Valley Authority. Which sounds alot like the Obama administration's recent initiatives to increase small-business credit, build more infrastructure and make the R&D tax deduction permanent. While a case can be made for the first two as short-run stimulus, the benefits of the research and development tax credit are almost entirely of the long run variety. In the long run, higher productivity is good news: it means more output per worker and, therefore, higher average wages. However, it also means less employment is needed for any given level of output, which means the increase in unemployment during the recession was than the decline in output would normally imply (see this previous post). By increasing potential output, ceteris paribus, productivity growth increases the distance between actual economic activity and the economy's capacity sometimes known as the "output gap." This suggests that even stronger demand growth is necessary to close the gap. The resurgence of productivity growth in the mid-1990's is one of the factors that allowed the Fed to keep interest rates low and allow unemployment to fall to 4% without igniting inflation (whatever else we say about Alan Greenspan now, he deserves credit for recognizing this early on). If Eichengreen is correct, the "productivity boom-in-waiting" will raise the economy's speed limit, and this is one more reason for the Fed to step on it.